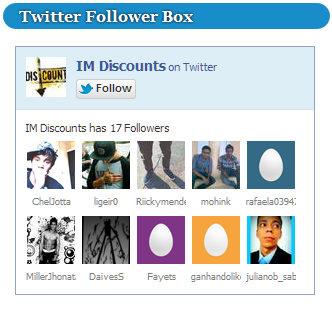 5 Responses to "Best Twitter Follower Box Widget For Blogger"
Thank you so much for this widget! I have been looking for something like this!! If you’d like, please pop over and take a peek! It is up and running. Hi, I have take the Code on my Website but it doesnt work. But why? Can you help? Twitter has changed some api’s today, the developer of this widget will fix the issue very soon. No need to change the code, please wait for sometime and it’ll automatically start working on your site. Thanks for the Answer. In the Moment it dont Work… Ok, I am waiting. Thank you so much for this widget! I have been looking for something like this! !